Meshstore is Australia’s leading online store for metal mesh products. Our aim is to create a simple and no-nonsense shopping experience, so you can easily find the products you need, or enjoy browsing for something that you like. We stock a wide range of mesh products at our network of locations around the country and so are able to offer Australia-wide delivery or the option to click-and-collect from your closest branch. By selecting your correct region when you visit Meshstore you’ll guarantee that you’re seeing up to date stock levels at your local warehouse while you shop. You are currently in Meshstore Western Australia (you can change this on the homepage if you need to). Buying online can offer many benefits. Unlike bricks and mortar stores, Meshstore is always open, so you are not tied to business trading hours and can shop when it’s convenient to you. Your location, however remote, is also not a barrier. Don’t waste your valuable time traveling to a store and then waiting to speak to a salesperson, with Meshstore you can shop from wherever you are. We’ve also built Meshstore to work on whatever device you’ve got in front of you. You’ll get the same Meshstore website with all the same functions, but tailored to your screen size, whether you’re using your PC, tablet or mobile. Finding the right product should also be a snap. We know that everyone’s needs are slightly different and so Meshstore offers several different ways for you to navigate around. If you know exactly what you’re looking for then tap it straight into the search box. If you need a little more guidance then Meshstore allows you to filter the range in a variety of different ways, for example you can browse by product type, application, material or price. Whether it’s general purpose mesh sheets for a trailer repair, decorative garden screens or walkway mesh for roof access, the right product should only be a click or two away. We know that the visitors to Meshstore are as diverse as the products we offer. Meshstore is a regular stop for tradies, fabricators, handymen, keen hobbyists and DIY enthusiasts. Not to mention all the landscapers, shopfitters, interior designers, artists, furniture makers and infinite number of other trades that need a small quantity of mesh, from time to time. Mesh products are commonly used for decorative features, repairs, privacy screens, safety, security and a thousand and one other purposes. All the products you’ll find here are of absolute top quality and the majority are made right here in Australia. The Meshstore product range includes perforated metal, expanded metal mesh, wire mesh, as well as products for specific purposes like planking or louvres. You’ll also find complimentary products such as the new Monowills Link range from Webforge. 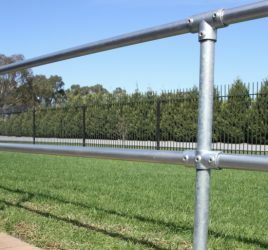 Monowills Link is a highly versatile modular handrail system that can be used for safety barriers, handrails or balustrades. What are the Benefits of Modular Handrail?